Set in the quaint heritage town of Borris, we had the pleasure of sampling some real foodie treats last Friday. The Step House Hotel is a family run business, with husband and wife team James and Cait Coady having invested heavily in a beautiful redevelopment of the original Georgian building. It is not surprising this hotel is such a popular destination for weddings as it really is a fantastic mix of old and contemporary design that really lends itself to a truly romantic setting. So what better place to spend a wedding anniversary. We took the short trip from Dublin to avail of a super offer for The Step House’s “Taste of Friday” Dine and stay offer €125 per person for an 8 course tasting menu and overnight stay. The focus of the dinner was on local and seasonal produce, something the award winning head chef Alan Foley, previously of Chapter One, prides himself on. When you see the execution of each dish it is clear to see the fine dining background of Foley shine through. As part of the offer the night began with a sparkling wine reception in the cocktail bar, which gives you a chance to ease into the evening and have a chat with some of the other couples who had come from Dublin, Galway, Cork and of course regulars from Carlow to name but a few. We were then led down to the much acclaimed Cellar restaurant. The dining room in set into several interconnecting rooms with decorative archways, vaulted ceilings and crisp linen tablecloths throughout. The lighting is just prefect in these rooms, not too dark so you can barely read your menu but dim enough to create a relaxed atmosphere. Alan’s menu was full of interesting sounding dishes and first up was roast scallop, lemon, pak choi and squid ink. Scallops are always a winner once cooked well and in this case they were cooked to perfection. Next up was Tom Salter’s Ham hock, a divine foie gras with a beetroot sorbet and roasted hazelnuts. The sorbet was a real winner in this dish and was paired so well with the foie gras. We opted for a 2011 La Chiara Gavi which went really well with both courses. Rabbit dishes can often divide opinion and listening around the room there was a few reservations but when a light looking organic rabbit risotto arrived opinions were changed on this superb dish. The risotto was creamy in texture and the rabbit had been lightly shredded with a madeira jelly and gently seasoned with black garlic. This is a must try if you visit the Cellar restaurant. The following dish was a Michael Healy Wild Wicklow venison, the quality of all the meats used were outstanding and it is clear to see why The Step House does not compromise on its high end organic produce. This was served with a spiced bread sauce, organic cabbage and pear with stunningly rich flavours bursting through. A 2011 Cruz Alba Tempranillo accompanied and was a match made in heaven. With a little break to enjoy the wine, a fine piece of Kavanagh’s Oxtail with a delicious parsley puree, pickled garlic jus and and bone marrow bon bon to boot arrived. Another successful plate and well explained by the local waiting staff employed by the Coates. After all these red meats we needed a little palate cleanser and you cannot go wrong with a Hendricks gin cream and cucumber granita, frothy and refreshing just what you need before a sinful dessert! It may be an oldie, but this was no ordinary Sticky Toffee Pudding. Elegant presentation, fluffy pudding with the popcorn and apple giving this dish that little something extra. A sweet Monbazillac, Chateau Varix dessert wine accompanied, complimenting the dish in every way. Wine pairing was optional, but highly recommended and cost an extra €35 per person. We were fortunate enough to be looked after on the night by Ellen, who was more than capable of conveying Alan’s menu and what he and the team were trying to achieve. You can have the best plate of food in the world spoiled by bad service, but the Step House have a this down to a tee. Relaxed, friendly and attentive staff who make every dish come to life. There are two more dates left to avail of this amazing offer 13th March and 3rd April, to book click here. This is a Friday Taste and Culinary Break we highly recommend. 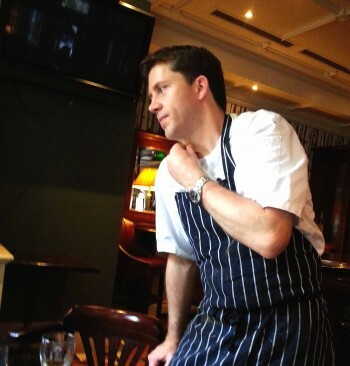 Chef Alan Foley, a Carlow native, began plying his trade at Ashford Castle. He continued to broaden his skills in the previously Michelin Star rated Sheen Falls Lodge where he became a sous chef. He later moved on to Peacock Alley under Conrad Gallagher & then on to Chapter One with Ross Lewis. Today he has honed his fine culinary skills to produce some outstanding dishes at the award winning Step House Hotel, where he is head chef. He won The Bridgestone Guides Chef of the Year 2014 & continues to strive to serve the best local produce with a huge emphasis on organic suppliers.